This is my story… a story of what happens when you trust an alien race. A race that lived peacefully with humans for over two years, but something suddenly changed. When all hell breaks loose, can we count on the Taoree to step up and help or could they be the real cause of all the terror? Three of my friends and I try to make our way back home to our families, but there’s chaos at every turn. We can trust no one; we only rely on each other. And even though we work together, nothing can stop the heartbreak and terror that surrounds us. Before you judge me, ask yourself this: When there’s danger at every turn and nowhere safe to hide, what would you do to keep you and yours alive? Some of us won’t survive… What will happen to those of us that are left behind? 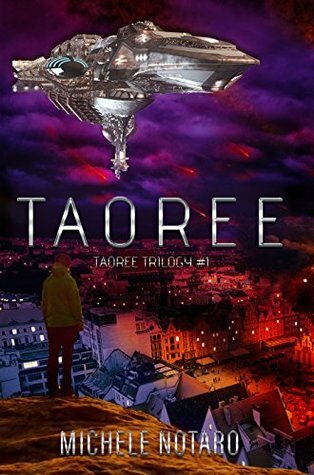 Taoree is Book One in the Taoree Trilogy and is meant to be read as part of a series. This book ends on a cliffhanger, but there is a promise of a happy ending at the end of the trilogy. Two years ago, alien spaceships came to earth. The Taorees said they came in peace, to share the earth with the humankind. For two years, the two species lived in peace, until one day, humans start to have some major seizures then they’re able to be commanded by the Taroees, and they start to kill other humans. Jeremy, Cal, Nolan, and Colt are at college when the crisis started, and decide to come back to their home to find their families. It’s the beginning of a long and dangerous journey without knowing what will wait for them at the end. OH.MY.GOD, this book is FANTASTIC. Just so you know, I don’t read dystopia. I hate it because It depresses me, all the time. So as much as I love Michele Notaro’s books, I was a little bit scared to read this one, but I decided to give it a go because it was Michele. I read the book in 5 hours, until 4am in the morning, I couldn’t stop, and if my stupid body didn’t ask me to sleep, I would probably have started book 2 and read all night and morning and day until the end of the trilogy (stupid body and stupid need to sleep). Anyway, I adored this book. The story is told from Jeremy’s point of view only. He’s gay, young, and happy. He’s in college with his two best friends, Cal and Nolan, and with Colt, Cal’s brother and secret crush of J. When people around them start to have major seizures and try to kill them, their little group of four have to survive by any means necessary including killing other people—the ferals, as they named them. In all this horror and trauma, Jeremy and Colt start a relationship. They’re in love, and they fight together. But Jeremy has weird dreams about a Taoree, and he doesn’t understand the meaning of these dreams, until he finally meets Orrean, a member of the Taoree’s resistance and wants to help Jeremy and his family to be safe. The book is divided into two quests. The first one entailed Jeremy, Colt, Cal, and Nolan trying to get back to their home and their families. The second one is when they finally come back to their homes and agree to follow Orrean to the Independent camp. The plot is captivating and interesting. The characters are very well developed—they are complex like human beings can be. I loved all of them. It reminded me of the Walking Dead in a Sci-fi version, how a group of humans are ready to do anything to survive and have a chance to be safe and happy. This book is about surviving, but also love, family, friendship and most of all, what a person will do to protect the people they love. The MCs are all young, but facing the dangers, they are incredibly mature, smart and united no matter what. I really loved them all and got attached to all of them very fast. That’s probably why I cried a lot at the end, big fat baby tears. I was warned! I knew something was coming, but I couldn’t help but cry a river of tears. I hated Michele a little bit at this precise moment, but it wasn’t the end-end but the beginning of a new era with a new quest. I need to warn you, don’t read after your manicure, it will be ruined otherwise. If you love to read about alien invasions versus human resistance this book is for you. It’s a big 5 stars.